In SAGES2009, we reported a new surgical system that replaces carbon dioxide gas into isotonic water in laparoscopic surgery (WaFLES). The method is reported to be advantageous in RFA to the liver tumor by Sasaki et al in 2010 Annual Meeting of Japan Society for Endoscopic Surgery. Similarly, water-immersion technique during standard endoscopy for alimentary tract is reported to be useful. In the setting of procedure in the water, buoyancy and water flow can be forces to position endoscope adequately. 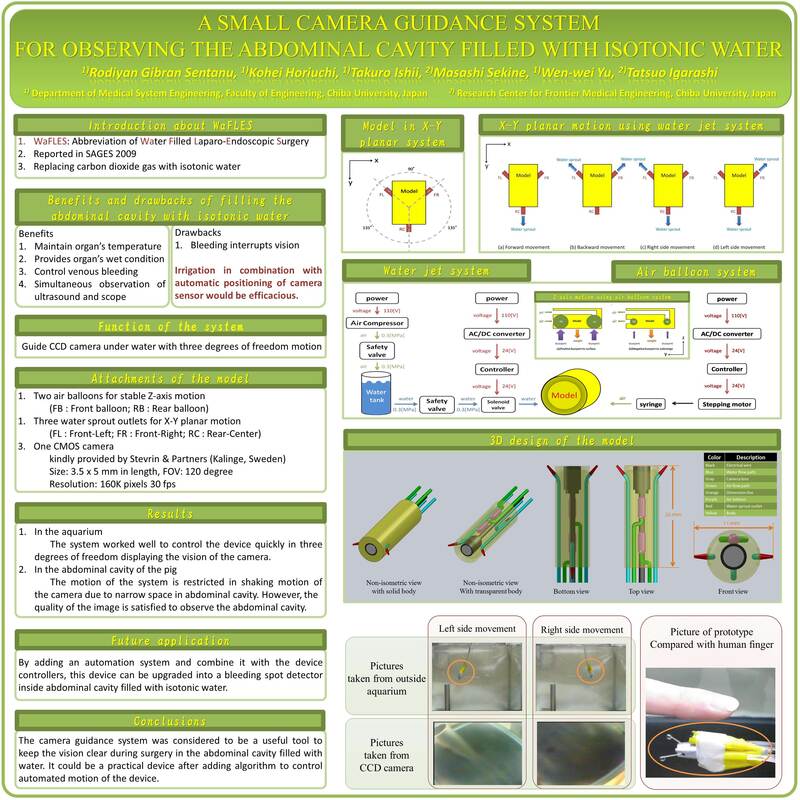 We developed a small camera guidance device that carry camera to surgical field moving in the abdominal cavity. The camera guidance device is designed to be waterproof functionality, visual field stability, controlled moving ability, and with a structure that allowed its insertion to the abdominal cavity through trocar. In extracting propelling force, water jet system was adopted to guide the device in four directions. The device was connected with high pressure water reservoir via three tubes for water jet system and an air balloon. The solenoid valves and an air pump were used to control water jet and buoyancy of the device electrically. The small camera is kindly provided by Stevrin & Partners (Blekinge, Sweden). Prototype models were prepared and tested their performance in the aquarium and abdominal cavity of the pig. In the first prototype, sized 2 cm in diameter and 8 cm length, was tested using aquarium. The force generated by the system worked well to control the device quickly, in four freedom of motion. The air balloon set inside the device controlled the floating and sinking motion through changing its volume using air pump. However, in the abdominal cavity of the pig filled with three liters of isotonic water, the motion was rather restricted due to inadequate space for the motion of the device. 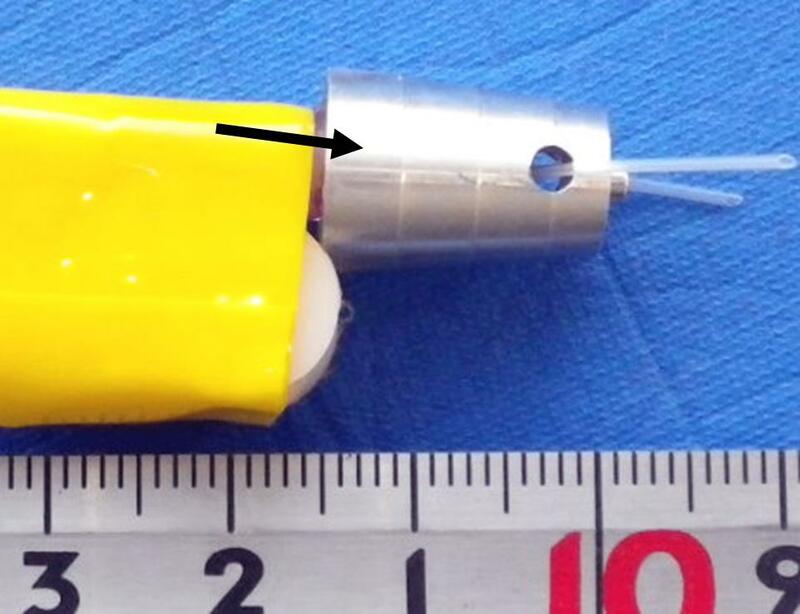 The second prototype with smaller size, 2 cm in diameter and 4 cm length (figure), was prepared and tested in the aquarium and showed better performance. Animal experiment using the device equipped with small camera is under way. The camera guidance system was considered to be a useful tool to carry a camera in the abdominal cavity filled with water. It could be a practical device after attaining smaller size equipped with the present propelling-controlling mechanism.